French Republic is a country which is located in the Western Europe. It is bordered by the Bay of Biscay, North Sea and English Channel (Atlantic Ocean) to the west and north, in the south - by the Mediterranean Sea. France has borders with Germany, Switzerland, Monaco, Italy, Spain, Andorra, Belgium, Luxembourg. The capital of France is Paris. France has a predominantly flat terrain, and the French mountains (Pyrenees, Alps, Jura) form the natural border of the country. The climate in mainland France is temperate (hot summers, mild wet winters), in the eastern mountainous areas has a continental climate (hot summers and cold winters), and the Mediterranean coast is located in a zone of subtropical climate (warm, dry summers, frequent short rains in spring and autumn). Average temperatures in the French capital - Paris: July - +15- +25 C, January - 6 + 1 C. France is a country with high living standards, with developed industry and social sphere, rich history and culture, etc. The seven million tourists from all over the world annually visit France, gaining a lot of unforgettable experience. France is the Côte d'Azur, luxurious, romantic Paris, ski respectable, well-known spa and climatic health resorts, the Cannes festival, ancient castles and high-speed trains, modern technology and modern traditions, the French fashion and perfumes, fine cuisine and wine. Every year a number of Russian fans of quality of life, the beauty of the Cote d'Azur and the local temperate climate increases. Currently, it is not only prestigious, but also advantageous to have a commercial or residential luxury property in France and renting real estate in France will bring an additional income to the owner. The property market in France is time-proved. Despite the crisis, it has not witnessed a collapse in prices and no massive influx of new real estate in France. Now it is the best time to buy property in France, while the cost of facilities is within reasonable limits and you still have a choice. French real estate in Paris and at the Cote d'Azur is always in a special demand. Also property in France in other areas has become appreciated recently, particularly in the mountainous regions of the Alps and Pyrenees. Buying property in France at the resorts of Aquitaine is a sign of a good taste, and buying a property in Biarritz (France) has become routine for royals and celebrities. Real estate in France in Corsica is an exclusive real estate designed for lovers of ancient history, wildlife and the benefits of modernity. Our foreign real estate agency can offer you a wide variety of real estate in France: villas, apartments, houses and commercial real estate in France. Before you buy a property in France, it is necessary to determine the place of purchase. Property in Nice is of a low cost, real estate in Cannes can be beneficial to lease it all year round, and property in Aquitaine (France) is suitable for a quiet holiday at sea. The specialists of our overseas property agency will help you to find a property in France, depending on the purpose of sale. We will arrange for you an inspection of the property in France, and our lawyers will accompany the purchase and sale of real estate from the start to finish. 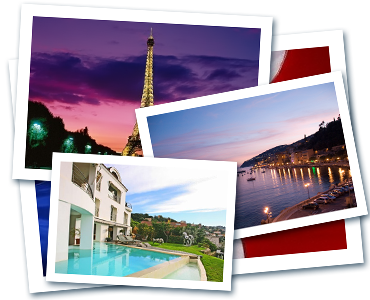 With our agency buying villa or apartment in France will be without a hassle on your part.